CITROEN H, HY, HZ, HX, HW, HISTORY. The Citroen H van was first shown at the 1947 Paris Motor Show, and production finally ended in 1981, which, amazingly, meant that this iconic vehicle had a production run of some 33 years. Imagine any car or van today being produced for that length of time with only minimal updates. 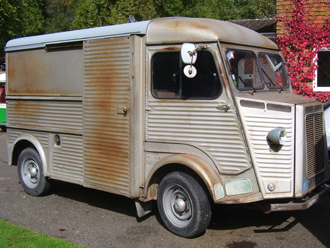 The consequence of that is that every Citroen H van (or derivative) is at least 30 years old and some are 60 or more! Therefore they are all old, and thus the reason that you must choose your vehicle with great care and preferably with the help of marque specialist H VAN WORLD. Firstly, let’s clear up the mystery of the names, particularly as most the vans look alike. The first model was simply known as the H. The HZ appeared in 1950 with softer springs (so unable to carry as much load), while the HY was introduced in 1959 and able to carry the heaviest load yet. 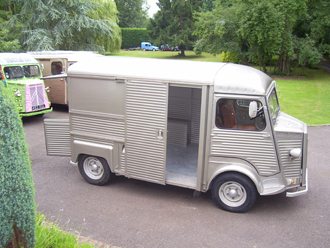 The HX was the designation given to the custom built refrigerated vans, whilst the HW signified that it was a betaillere (horsebox). The power units for the vans changed little. Just two1911cc four cylinder petrol engines were used over the entire production run, the later one also available as a 1600cc unit. The early engine was based on the engine used in the Citroen Traction, whilst the later cross flow engine with alloy head based on the Citroen ID car engine. From 1963, it was also possible to have a diesel engine, initially a Perkins unit but later an engine from Indenor. The diesel has plenty of torque, but is noisier than the petrol unit. All vans cruise happily at 55 – 60 mph. Although a few vans were built as right hand drive in the UK at Slough, you can say that all existing vans that are available will be left hand drive, the sole surviving right hand drive van is unlikely to be available! Exterior changes were few, but the biggest changes occurred in 1964 when the windscreen changed from a two piece to a single sheet of glass and the grille badge changed. At the same time, the window in the rear tailgate increased in size, and the nose cone of the van gained a flat top as opposed to its earlier rippled top. The last major visual change occurred in 1969, when the round rear wheel arches changed to a squared design. As already stated, the petrol engines changed once, as did the rear bumpers and the seats. Collectors today prefer the early split screen examples, but to most people, the later vans look the same, so for promotional / sales vans, either version is every bit as good. 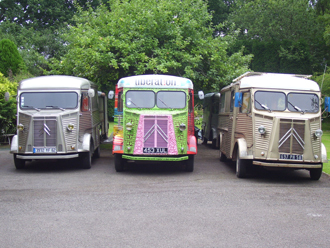 Call us at H VAN WORLD if you want any more details on the history of these super vans.